On Friday morning Micaela arrived after an all-night flight from Berkeley. We were both tired but excited to plan our first day exploring the city together. After coffee and bagels at Irving Farm Coffee we made our way by foot and subway to the High Line, a 1.5 mile long park built on railroad tracks up above the street. The rail line operated from 1934 to 1980 to carry mail, meat and produce to the meatpacking district. This window would have been only a few feet from the train! Neighboring property values now sky high so construction everywhere. So many great views of the city! Huge, mutliblock building. I wonder what it is? Next we began a long, crazy, circuitous walk to Greenwich Village, first trying to use Google map directions on my phone (FAIL), then print maps, and finally just asking people on every corner. Sometimes we were told to turn around and go the other direction; once someone told us it was too far to walk, to take a taxi. Often the people I asked were from other countries (some really cute guys from Norway tried to help) or were just as lost as we were. A stand of “Citi-Bikes” you can takle for 30 minutes and leave at the next stand. I wanted to see if the funky Village tenement on MacDougal Street where I lived when I was 19 (I moved to Manhattan from San Diego with big dreams) and my old hangouts, Kettle of Fish bar across the street and Cafe Figaro on Bleecker were still there. The funky tenement looks unchanged, but according to this New York Times article the Figaro and original Kettle of Fish are long gone. We finally arrived around 3:00, explored the area a bit and then sat and sketched in Washington Square Park. It was a cloudy, breezy day and we kept getting sprinkled with spray from the fountain. At 5:00 we decided to try to make it to the 5:20 showing of the documentary Cutie and the Boxer about the art and lives of married, now elderly, artists Ushio and Noriko Shinohara, who came to New York from Japan when they were young (FYI the only boxing is with sponges on boxing gloves dipped in paint). it was nearly 5:00. There were people trying to get taxis on each corner so we walked a block, waved down a cab and arrived at the theater in time to grab a couple of fish soft tacos next door before the movie started. (They were a mess to eat in the dark but delicious). Getting around most of NYC is so much easier and cheaper than the SF Bay Area! 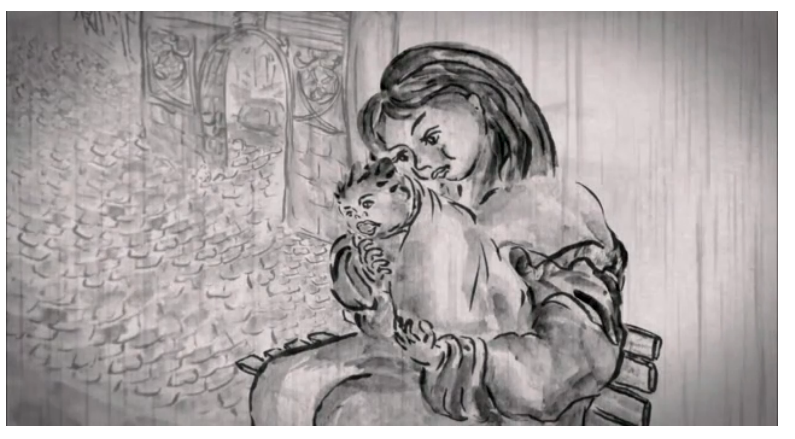 We both liked the thought-provoking film; I especially enjoyed seeing Noriko drawing the Washington Square Arch (above) in a sketch that looked a lot like my sketch of the arch. There’s a great video trailer on this NY Times review that shows many of the best parts of the film. Taking the subway home afterward we had to change trains and walk through Union Square. There was a group of Hare Krishnas playing music, singing and dancing, but with added NYC flair: the saffron-robed guys were doing occasional break-dance and Bollywood moves! Across the street we at spotted a Whole Foods and went in to shop for supplies. We were way tired and overstimulated and Whole Foods was packed with shoppers who knew their way around. We finally figured out the two-story layout, got the basics and stumbled to the long check out lines. Like the subways, there was a complicated system of numbers and colors and electronics meant to guide you to your destination, in this case one of 35 or so cash registers in five lines from the queues of shoppers standing under different colored banners. I thought I had the system figured out so when the person in front of me didn’t go when it was her turn, I tapped her and told her to go. She and others in the lines gave me a pitying look. Apparently I got it wrong. Finally, heads spinning, shopping bags and hearts full, we got back on the subway and found our way home. We plugged in and inflated the airbed our Airbnb host had left for Micaela (having to hold it up on its side in order to reach the one visible outlet) and soon we were sound asleep in our own semi-comfortable beds. Thank you for letting us be part of your New York experience! i am SO enjoying these entries. thanks for all your creativity! Jana, I was 19 when I moved to NYC, too, on an Antioch co-op job. I lived over on Thompson. Street in a Cold Water Flat. 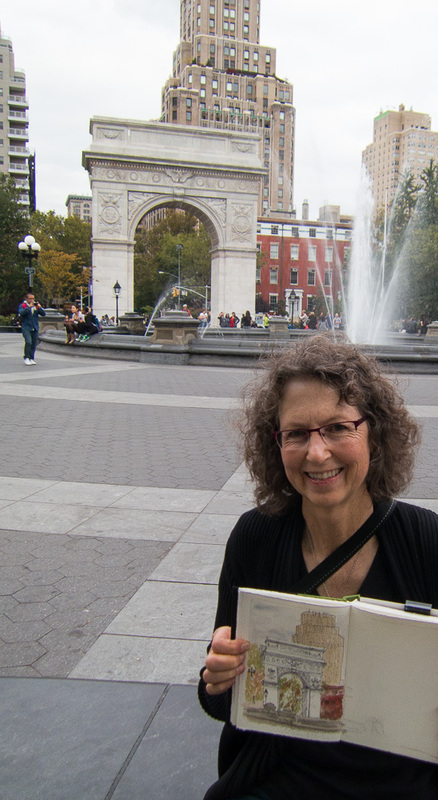 It brought it all back seeing your great sketch of the Washington Square arch and fountain. We all spent our weekends there in the Circle. Oh, what fun, Jana !!! !What year were you there ? I was there on an Antioch co-op job in the spring/summer, 1953. My friend and I rented this sublet on Thompson Street. Bathtub in the kitchen, WC in the hall, no heat. But plenty of hot water, oddly enough. I visited the apartment with my daughter in 1982 and it was still the same. Probably by now, all that has been wiped out and converted to expensive stuff. Do you know? I miss the Figaro Cafe too. It’s great that you walked so much and you were very brave to hop on and off the subways the way you did. Love all your sketches. The one of the Washington Square arch is fab! Wow! I absolutely ate up this post. I felt like I was right there walking with you. I can’t wait for more…BEE-you-tee-ful work by the way. 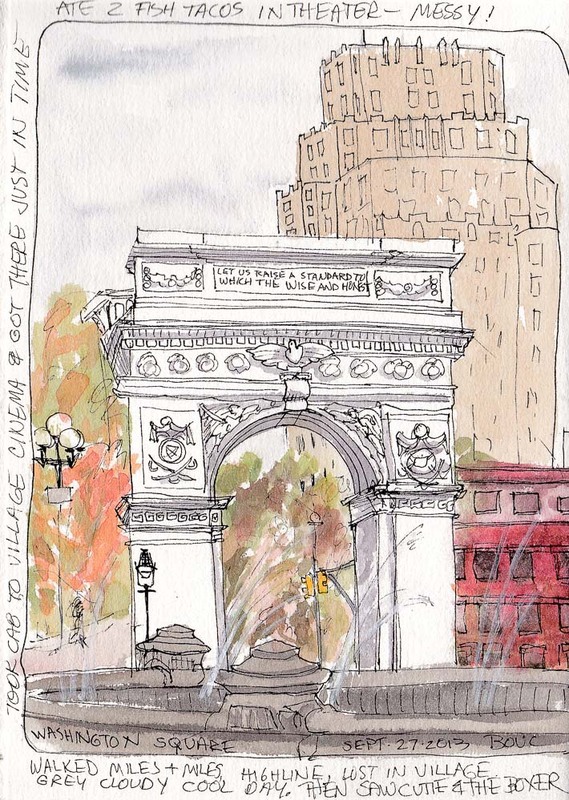 Fabulous sketch of Washington Square.